Ever since Rouge Double Intensite Lip Color in shade Rose Garnet, swatched here, was chucked out of Chanel's inventory last Fall, I have been hunting for an all-day lipstick in a subtle-enough shade. I have shade issues with MUFE Aqua Rouge (what part of subtle dusty rose is so difficult to understand? ), flaking issues with Max Factor Lipfinity, CoverGirl Outlast, Revlon Colorstay Ultimate, Maybelline 16hr Superstay and, worst of all, MAC ProLongwear, the metallic tint in Estee Lauder Double Wear Stay-in-Place Lip Duo, and a host of other problems with similar liquid formulae. I was thrilled to find that Rimmel was coming out with Provocalips, which they claim is the more advanced, transfer-proof and long-wearing version of last year's Apocalips (Show Off in the US), which I have reviewed here. While I did like Apocalips, it did not have even half the staying power I am used to - I want a lipstick to last the whole day, so I can forget all about it and concentrate on whatever I am doing. There are eight shades in Rimmel's Provocalips range, which launched on October 6 this year. Each costs £6.99. The shades include very subtle neutrals, pretty pinks, a classic red and a vampy berry. Rimmel Provocalips is now my favourite drugstore lip colour range. And two of these shades are perfect for me. 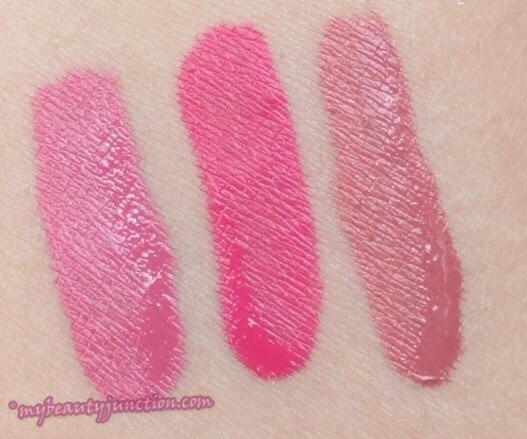 Read on for my review of Rimmel Provocalips 16hr Lip Colours. 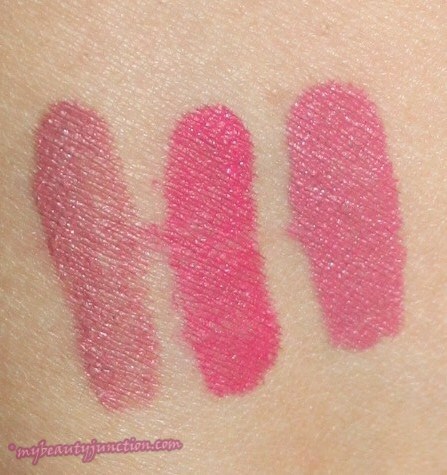 Like most liquid lipsticks which are transfer-proof, these come in double-ended tubes, with a gloss at the other end. Applicators on both ends are doe-foot. I have heard derogatory remarks about the plastic packaging, particularly the gloss-end, which is white with a print of lips. To be honest, I do not have a problem with this as long as the dang product wears long enough on me. Clearly, Rimmel has tried to appeal to a younger crowd here. Nothing wrong with that - in fact, this tube stands out amid all the other similar double-ended tubes of long-wearing lipsticks I have, so it will be easy to pick out. Remember Max Factor's Lipfinity? Initially, I was worried that Rimmel Provocalips would be a dupe for those. Lipfinity flakes off on me, although not as much as MAC's ProLongwear and Maybelline 16hr Superstay and Revlon Colorstay Ultimate would, and I would end up looking like I have red bits hanging out of my mouth. The formula of Provocalips is much, much runnier than Lipfinity. Not as thin as Chanel Rouge Double Intensite. But runnier and thinner than MUFE Aqua Rouge or Estee Lauder Double Wear Stay in Place Lip Duos or even Mikyajy Sabayas seen here. Pigmentation is intense, you get full coverage with a light swipe, and you can build up or go for a thicker application, though that can cause some flaking. These are absolutely transfer-proof. You need a very light hand to avoid patchiness here. Step one is the coloured end, while step two is the lock and shine gloss. More than an actual lip gloss, it feels like a lubricating balm. But the gloss serves to deepen the colour just a bit rather than make the lips all glossy. It prevents dryness nicely. These take longer to dry than Chanel Rouge Double Intensite but are much quicker-drying than Bourjois Rouge Edition Velvet lipsticks, which I will show you in a week or so. Removal could be a problem. You will need a bi-phase makeup remover such as Lancome Bi-Facil for this one, and even so, you will have traces left the morning after. These are water-proof and transfer-proof, but they do fade when faced with an oily meal. Fading occurs from the inner lips - something which Chanel Rouge Double Intensite manages to avoid - but fading/peeling is mild; far, far milder than MUFE Aqua Rouge and other similar long-wearing liquid formulae.. 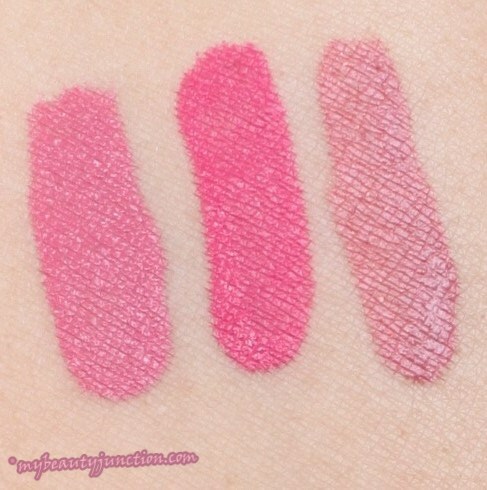 The shade names are interesting - Skinny Dipping (you know that is a barely-there neutral), Dare To Pink (Duh! V. v. pale, though), Kiss Me You Fool (bright red), Play With Fire (wine red), Kiss Fatal (v. vampy berry), I'll Call You, Little Minx and Make Your Move. I am going to show you Make Your Move, I'll Call You and Little Minx. All swatches are on NC37/Estee Lauder Double Wear Tawny/Double Wear Light Intensity 2.0 skin. I'll Call You is a mauvey pink which SCREAMS "me" - if you are reading this, Amber of Daydreaming Beauty, yep, this is "our" shade. Dusty pink with a hint of mauve. A tad mauvier than Rouge Double Intensite in Rose Garnet; more pink than rose, but definitely subtle "dusty pink" rather than anything else. Meet my new favourite long-wearing lip colour! Make Your Move is a true neutral... just mild brown with a tint of pinky-peach somewhere. Subtle, work-worthy, but sophisticated. This will go well with a bright eyeshadow, such as blue or purple. Little Minx is a medium bright fuchsia. For some reason, this looked a tad paler in online swatches. It also happens to be my Mum's shade, which is why I only have a hastily done arm-swatch for you and no on-lips swatch. This is a tad brighter than Sephora Velvet Cream Lip Stain in Endless Purple but nowhere near Too Faced Melted Fuchsia. My Mum has been a fuchsia person for a few years now ("When you reach my age, you will get over your obsession with subtle dusty rose." - I hope not). From left: I'll Call You, Little Minx and Make Your Move. Natural light. You can see that they are paler when fully dry. From left: I'll Call You, Little Minx, Make Your Move. On the lips, I'll Call You looks like this - just a light, very thin coat. Natural daylight, within car. This can look brighter/deeper with more product, but I'm happy with this shade. Here is a post-reapplication picture below, so you can see it looks pinker when you build up. There is some flaking on the centre of the lower lip as a result of reapplying, and a thicker application tends to enhance lines on the lips. I'll Call You indoors, with flash, WITH the gloss on top. When you apply this lip colour on hydrated, fresh lips, and apply the gloss on top, it gives the best results. Make Your Move on the lips. Natural (cloudy) evening light, in car, WITH the gloss on top. Sorry this is a smaller photo. It was one of those high-traffic days and I did not manage to zoom in. Here are the swatches after a shower. Some fading there, especially with Make Your Move (extreme left), but mostly intact. At the risk of being labelled crazy, I confess that I have FOUR tubes of I'll Call You and FOUR tubes of Make Your Move. I love both forever, though these are nowhere near as perfect as Chanel's Rouge Double Intensite. This has to be Rimmel's best lipstick ever, better than Apocalips any day. I cannot attest to 16-hour wear since I do not wear makeup that long anyway, but I can tell you it is difficult to remove this lip colour and that they do not peel or flake as insanely as Lipfinity, Outlast or ProLongwear. That said, Chanel Rouge Double Intensite is more un-budgeable, but you must remember that these are a fraction of the price of anything from Chanel. I have been wearing Provocalips in and out of season over the last one month now and have one each in my travel and daily bags and well as on my vanity. THIS is my HG drugstore lipstick. At £6.99 each, these are a steal. Apart from Rimmel counters around the world - in countries where these have launched - you can get Provocalips online. Grab them online NOW off Feelunique here, so you don't have to worry about your lipstick disappearing during Christmas parties. Feelunique ships worldwide for free. For those in the UK, you can get these online from Superdrug or Boots. Provocalips lip colours are also available on Amazon.com. Now that Crimbo is almost here, I highly recommend these as stocking stuffers as well as for yourselves to withstand all those parties.